Changing your door locks to more reliable models or adding more to the existing ones is an effective measure to increase the security of your home. For a thief, more time spent for the burglary means an increased risk of being caught. Needless to say, that if you are moving to a different house, replacing or at least rekeying the exterior locks is mandatory. Whether or not you add more locks, remember to replace the short screws in strike plates and hinges with screws long enough to go through the door frame and into the door’s rough opening. Otherwise, during a robbery the entire door and frame—with locks still in place—can be knocked out of its rough opening. The typical exterior door lock comprises a keyed knob or lever which controls a spring bolt. A spring in the mechanism extends the bolt from the door’s edge. When the door is closed, the tapered end of the spring bolt extends into the door’s frame. The spring bolt will always extend unless retracted with a key or knob—helping to keep a door closed. While this lock is ideal for children running in and out of the house, it is not ideal for preventing a burglary. With the right tools a thief can retract a spring bolt when the door is locked. Because a deadbolt has a cam mechanism to extend or retract the bolt, the bolt cannot be retracted when locked. A single cylinder deadbolt has a keyhole on the outside and a thumb turn on the inside to control the cam mechanism. 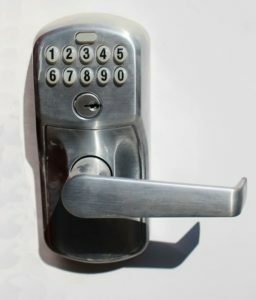 A double cylinder deadbolt uses keys for both the inside and outside control. During a robbery a thief can make a hole in your door or nearby window and easily unlock a single cylinder deadbolt. Since it is keyed on the inside, a double cylinder deadbolt prevents this from happening. But to get out of your house quickly in an emergency, a single cylinder deadbolt is safer because no key is needed to open your door. Deadbolts can be cylindrical or mortise. A cylindrical deadbolt mounts through a hole in the face of the door. A mortise deadbolt installs in a cut-out in the edge of the door. The door itself can withstand a stronger blow with a cylindrical deadbolt because less door material has to be removed for installation. But it is easier for a thief to jimmy a cylindrical deadbolt because it mounts on the door’s face. Since a thief can only access a mortise deadbolt when the outer edge of the door is exposed, it provides more protection than a cylindrical deadbolt. However, because this type needs a larger amount of the door material to be removed in order to install the lock into the pocket, it can weaken the door itself. A vertical deadbolt is unique in that the deadbolt attached to the door interlocks with the bracket attached to the door jamb. Unlike other deadbolts, this configuration makes it difficult to pry the two sections apart—hence the name jimmy proof. The vertical deadbolt is surface mounted on both the door and the jamb with minimal machining to install. While the lock itself is very secure, its effectiveness depends on the quality of the installation. If the mounting screws do not extend through the jamb and into the rough opening, an exterior door can easily be kicked open during a break in. Cylindrical locksets with either knobs or levers line the shelves at any home improvement store. These locksets are a great choice for interior doors where privacy is more of a concern than security. But don’t rely only on a cylindrical lockset to secure an exterior door. This type of residential lock has a spring bolt which a thief can retract, even when the door is locked. For better security, make sure a cylindrical lockset is always paired with a deadbolt. Easy to install, a rim latch lock is mounted on the surface of both the door and the jamb. Rim latch locks are primarily used in apartment complexes which have controlled building access. They are not designed to withstand a large amount of force and are not suitable for use on an exterior door in your home unless paired with another type of lockset. Often rim latches are designed to lock automatically when you shut the door. 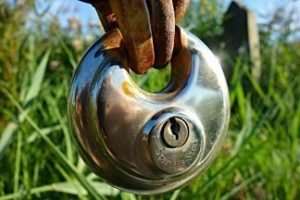 So if you forget your keys inside, and there is nobody home, you will get locked out of your house and need a locksmith for a home lockout service. Because rim latches have been in use for over a century, modern replicas of antique rim latch locks can add a historic look to your doors. Electronic door locks are convenient to use since you open your door with a keypad—no reaching into your pocket or purse for a key. But this convenience is expensive. Not only is the lock itself expensive, but the installation costs are high. To equip your front door with an electronic lock requires a skilled professional who will install low voltage wiring to the door frame. Also note that some types of electronic locks will not keep the door secure in a power failure. Make sure the lock you purchase will keep the door locked with or without electricity. Add wireless technology to an electronic lock and you have a smart lock. Smart locks are even more expensive than electronic locks, but they are more convenient for some people. Are you typically on your phone when you get to your front door? You can use your phone as your key. Your smart lock can also be unlocked with proximity sensors like Bluetooth and NFC. So if you have a little techie in you, a smart lock will give you more features than a door knob ever can. 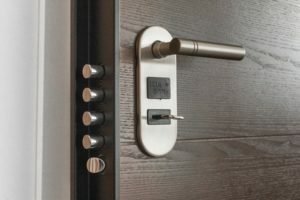 Digital Trends recently tested the latest smart lock models and published an overview of the best ones in 2019. If you’ve ever stayed in an older motel, you have used either a sliding barrel bolt or a chain lock to secure your room as you slept. While not very attractive, both are inexpensive and easy to install. The sliding barrel bolt comprises a bolt assembly that mounts on the surface of the door and a receiver for the sliding bolt that mounts on the edge of the door frame. The chain lock has a mounting mechanism with the chain which attaches to the edge of the door frame and a receiver which attaches to the door. Padlocks are manufactured in two basic configurations—the simple padlock and the circular padlock. 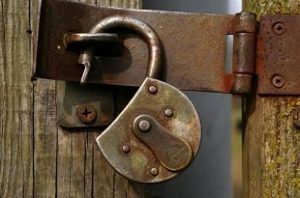 Padlocks are suitable for securing doors in outbuildings such as storage sheds. Coupled with a chain, padlocks are also perfect for locking gates in exterior fencing. The simple padlock has a main body with a U-shaped bar that moves in and out of the body when released by a key. The circular padlock is round with a notch in one edge. A curved bar extends and retracts within that notch by the turning of a key. Child safety locks are not meant for security, but are designed to keep a child safe from injury. However, a childproof front door lock can save your property from a break in or even your child from being kidnapped. If criminals visit your house with the child left home alone, and convince the kid to open the door, the baby proof lock will make it physically impossible. Baby safety locks are available in many configurations to fit just about any door and any type of furniture. Install in areas where you store cleaning chemicals and medications. Also protect children from falling hazards by installing child safety locks at the foot or head of staircases. If you have to leave a small child alone for a short time, a child safety lock will prevent the kid from walking out of the house unsupervised. To install such locks you can hire a babyproofing hardware installation company, such as Precious Baby Protectors. 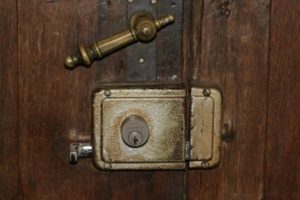 Now you know about the types of locks for homes and probably have already decided which ones you need for which doors. However, after selecting the proper lock, you probably also need it to be installed. 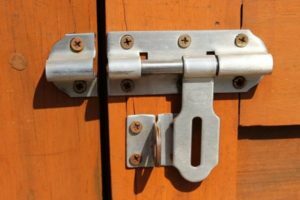 Lock installation, especially when it comes to mortise and electronic locks, is a process requiring professional skills, otherwise there is a chance to damage the door or the lock in the process. If you live in Houston, TX or its surrounding area, consider our reliable residential locksmith services to install or repair locks on your home doors and windows, and even get the quickest help if one day you lock yourself out of your home. In addition to locks, there are many other measures to protect your home from burglary: from simple ways that don’t require more than common sense to advanced technological solutions such as security systems. If you are interested in learning more about improving the safety of your residential property, here is a nice article with 9 tips on this subject. Laura Bierman is a home improvement enthusiast, who has been in the industry for more than 15 years. Her passion is to share her expertise through writing on a wide range of home improvement topics. Laura holds a position as a creative content director at Youthful Home, a rapidly-growing, North American home owner and contractor portal. You can find Laura on Facebook and Twitter.